Let’s be honest, Christmas can be exhausting!!! And time is at a premium during the holidays, for sure! 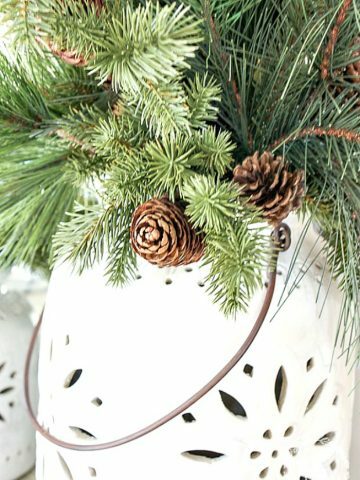 How about making a fun and easy and fabulous Christmas decoration that will only take 10 minutes to put together and will last until the New Year? 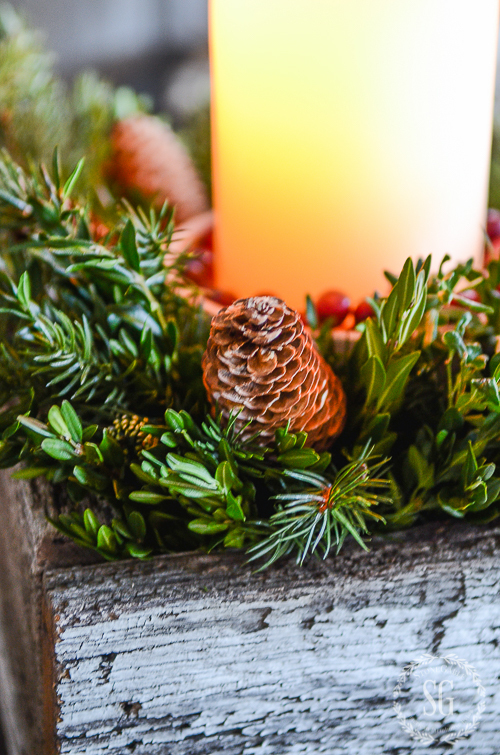 Let’s gather up some pretty Christmassy things and make an arrangement that you can use on a table! 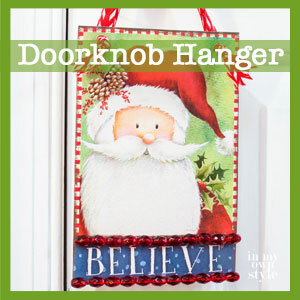 Even if you are not crafty, you can do this! Sound good? I’ll show you how! 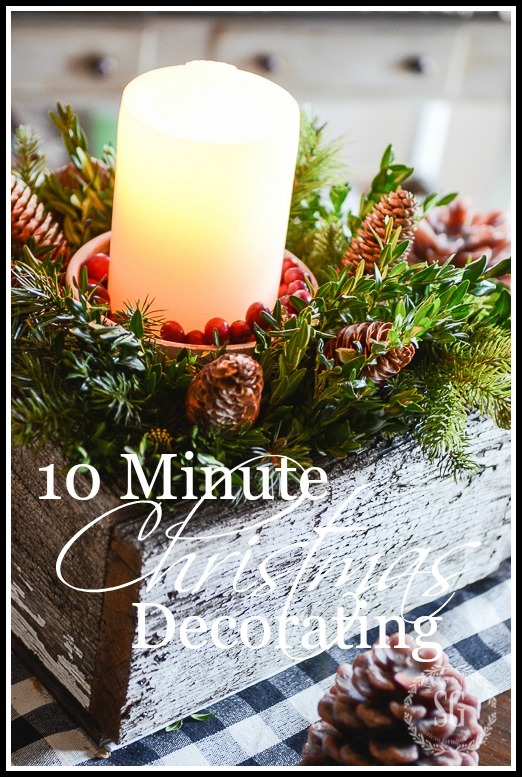 Make sure you check out the great 10 MINUTE CHRISTMAS DECORATING ideas from my blogging friends at the end of this post! make it your own and add other things too! I put the arrangement together on my potting bench right outside my back door. 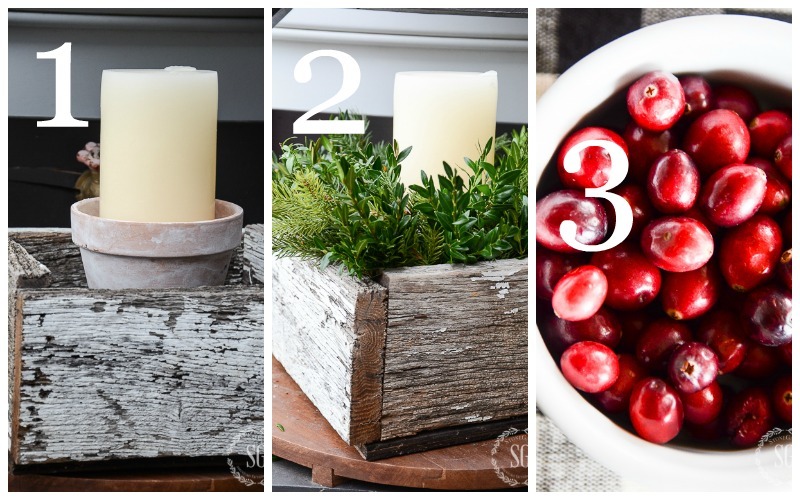 Put a terracotta pot in the box (or what you are using to hold your arrangement) and the candle in the pot. Cut and arrange greens in the box around the terracotta pot. 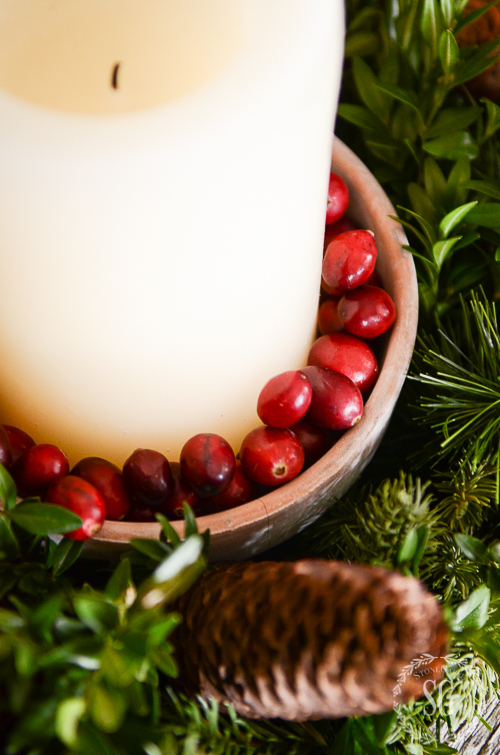 Add fresh cranberries into the terracotta pot around the candle. And tuck baby pinecones into the greens. See, easy-peasy and so full of Christmas spirit! 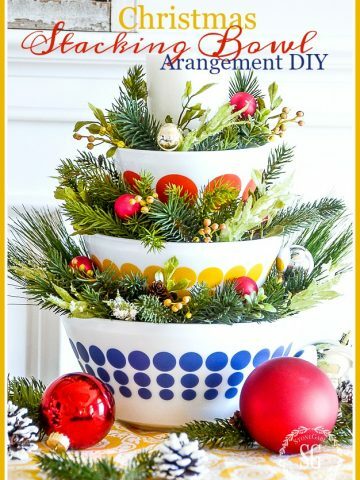 Remember, even if you are not crafty or a decorator YOU CAN DO THIS!!! I have my 10 MINUTE CHRISTMAS DECOR on my kitchen table. 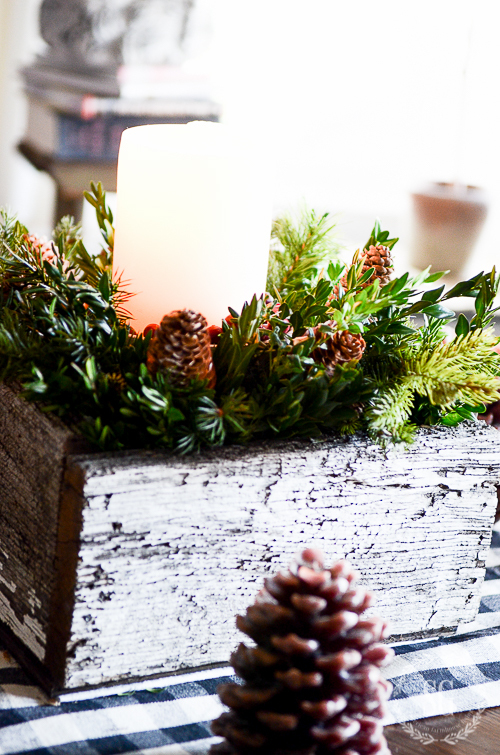 I added a few pinecone candles I got at my local Pottery Barn outlet last year around the arrangement. 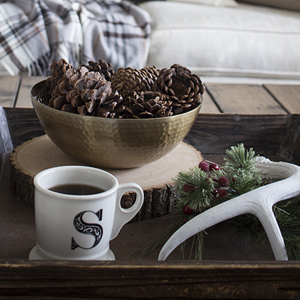 Wouldn’t this make a thoughtful and amazing hostess gift? 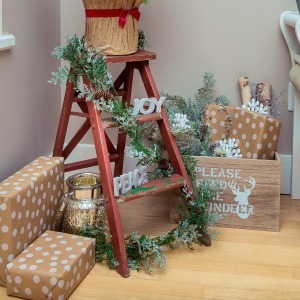 Get inspired and make Christmas decorating easy this year… visit the following blogs! 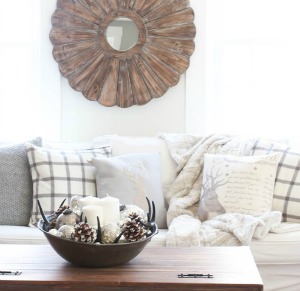 You can follow me on Pinterest and see all the great things I am finding to pin Here. I love this, Yvonne. Simple & so pretty! I can do this! Thanks for sharing. I love your 10 minute Christmas ideas. Great ideas. After 30 years in our home, we have moved to an apartment which we are enjoying so much. 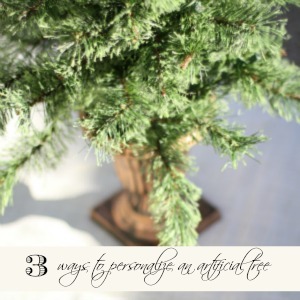 With a smaller space, we have had to incorporate smaller decorations and these are some great ideas. Also, we can not burn candles in the apt. so thank goodness for the battery operated candles; I can still decorate with lights. Our patio has a permanent plant hanger so your idea of this will work well. Thanks for all the new ideas. So simple and so beautiful! Love this idea. 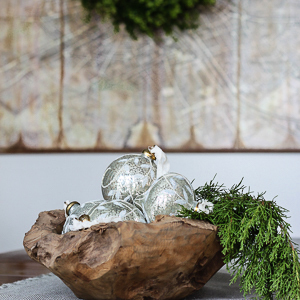 Love love love the bowl decorations! You are amazing! You did it again! Love it and the SPOT ON Vintage Bowl Set! How easey peasey to make. Thank You Yvonne! Having moved this year, I’ve had to rethink my decorations. I’m keeping it simple. Your ideas are a big help in doing that! Thank you! Simple,quick and beautiful. What more could you ask for. Thank you again for a beautiful arrangement. 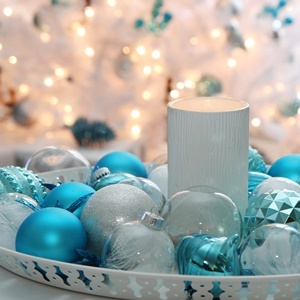 Beautiful decorating as always! Thank you for the inspiration! Very pretty! I’m going to try this! ! 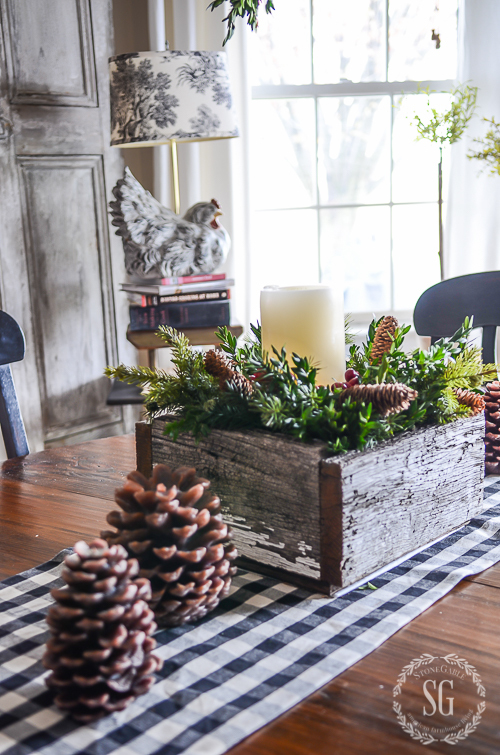 Another idea for faux greenery….have the perfect box to makeover! 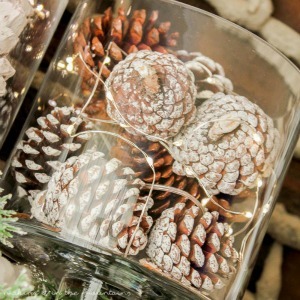 Only thing missing is pine cones…..we live in the mountains of Northern California…..so I can step out in the backyard gather up the pine cones…..perfect! 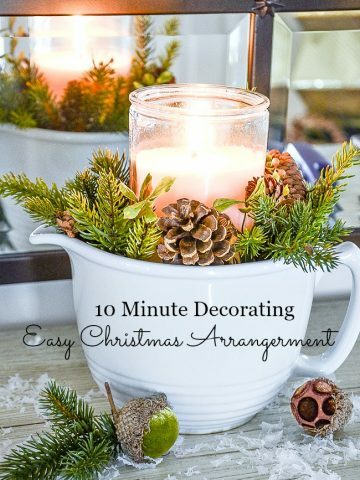 Hi Yvonne, I’m sorry to bother you with this silly question, but I have decided to make your beautiful 10 Minute Christmas centerpiece with the box and candle and greens. Where I am having a problem is knowing the size of your box to get some idea of the scale of this container you are using. I have everything but the box for a container. I don’t have anything else I can use. Can you tell me the dimensions, please? Yes I would like the dimensions too……I have barn lumber and I can have my husband put it together for me. Hi Patricia, The box is about 8″ square. Oh, how nice to have your husband make it! This is beautiful, looks like something you would spend hours on, love it! Zi love your center piece. It’s so cute. And just like you said so easy., like the idea of using cranberrys for color. Wish you closer so you could come over play for a bit and have some tea! ? You inspire me everyday. I have a pic of what I put together to show you, after reading today’s post, but I am not computer savvy enough to figure out how to attach the photo. If I can figure it out I will send. Thanks for all your posts! I would love that Candy! This is so very pretty and so simple. Thank you so much for the great idea! Looks lovely & so easy. Wonderful idea! My husband made a wooden box with the 30-degree angled sides similar to the one I saw in your fall kitchen decor. I am using it for my garden club Christmas auction and was trying to decide how to fill it. I am doing this. Thanks so much for sharing all of your wonderful ideas. So pretty and simple! I am learning so much from you this year since I began receiving your articles, tips, etc. Thanks, Yvonne! So glad to hear that, Shelley! What a fantastic simple look Yvonne. I love it and anything that take only a few minutes is for me. So pretty Yvonne! 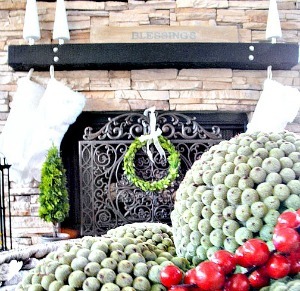 I love the idea of using the cranberries for a pop of color! !